Azerbaijani classical music includes a range of musical styles rooted in the traditions. One of the most brilliant pages in the history of national music undoubtedly belongs to legendary national composer, Gara Garayev. February 5, 2017 marks the 100th anniversary of one of the most outstanding figures in the national culture. The 100th anniversary of the great Azerbaijani composer, People's Artist of USSR, academician Gara Garayev has been marked at the UNESCO premises in Paris. The event was co-organized by Azerbaijan's Ministry of Culture and Tourism and the country's Permanent Mission to UNESCO. Azerbaijan's Minister of Foreign Affairs Elmar Mammadyarov and Culture and Tourism Minister Abulfas Garayev, daughter of the prominent composer Zuleykha Garayeva, as well as representatives of diplomatic corps accredited in Paris, representatives of the French public, business circles and permanent missions of foreign countries at UNESCO attended the event. Addressing the event, Permanent Representative of Azerbaijan to UNESCO, Ambassador Anar Karimov highlighted life and works of great composer. He said that the Azerbaijani folk music was a source of inspiration for the outstanding composer. He drew the audience’s attention to the fact that there is a street, subway station named after Gara Garayev in Baku. In order to perpetuate the memory of the prominent composer a monument to Gara Garayev was unveiled by President Ilham Aliyev in the center of Azerbaijan's capital. In his speech, Assistant Director-General for Communication and Information Sector at UNESCO Moez Chakchoukh stressed that Gara Garayev's music promotes dialogue among nations and reflects a way leading from the past to the future. 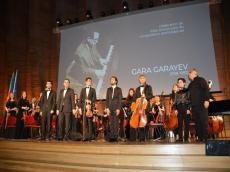 The gala evening was followed by a concert conducted by Fuad Ibrahimov, which featured performance of Farhad Badalbayli, Murad Huseynov, Vurghun Vakilov, Jamil Sadizade and Elvin Khoca Ganiyev. The concert was greeted by the audience with a storm of applause. Further, participants viewed a photo exhibition and documentary films devoted to the great composer Gara Garayev. Editions of a magazine and different CDs about the composer’s life and works were distributed among the participants. His ballet, "Path of Thunder", staged in 1958, was dedicated to racial conflicts in South Africa. In the same year, he wrote the score for the documentary film "A Story About the Oil Workers of the Caspian Sea", directed by Roman Karmen and set at the Oil Rocks. The composer leaved behind a legacy of music that will be felt for generations to come. The memory of great composer will always live in the hearts of Azerbaijani people.